On Sept. 5 President Donald Trump announced the end of the Deferred Action for Childhood Arrivals (DACA) program, but before he could get his announcement out, DACA recipients and their supporters had already begun protesting. The DACA program is an Obama-era executive order that allowed illegal immigrants, who entered the country as children, to receive a renewable two-year period of deferred action from deportation with eligibility for a work permit and driver’s licenses. The program currently caters to 800,000 recipients, who are referred to as DREAMers. Congress has six months to find a way to legalize the program or Trump will “revisit the issue”, according to his Sept. 5 tweet. Within this time, Trump’s administration will not accept any new DACA applications and two-year DACA permits expiring after March 5, 2018, will not be renewed. However, the Democratic party is not willing to take this sitting down. Sixteen Democratic and nonpartisan state attorneys generals filed a lawsuit following the announcement, claiming that repealing this program is discriminatory towards people of Mexican descent. They have pulled on previous statements the President has made that show his biases toward this ethnic group and feel that they have justified claims. “As President Trump’s statements about Mexico and those with Mexican roots show, the President has demonstrated a willingness to disparage Mexicans in a misguided attempt to secure support from his constituency, even when such impulses are impermissible motives for directing governmental policy,” the lawsuit states. A day following the decision, the Atlanta City Council took a stance on the issue, through passing an emergency resolution 9-1 that was proposed by Council member Kwanza Hall. The resolution calls for limited cooperation with the U.S. Immigrant and Customs Enforcement (ICE), in order to show that Atlanta opposes the decision to end DACA. Berenice Rosas, a DACA recipient and recent high school graduate with plans to attend Gwinnett Tech to study phenology, said that the program helped to get common necessities in her life. “I’m here to defend DACA, because I am a DACA student and this program helps me get a driver’s license, helps me get employed and helps me continue my studies,” she said. Phi Nguyen, a fellow protester said despite not being a recipient, she attended in support, because the repeal of DACA, she said, would be inhumane. 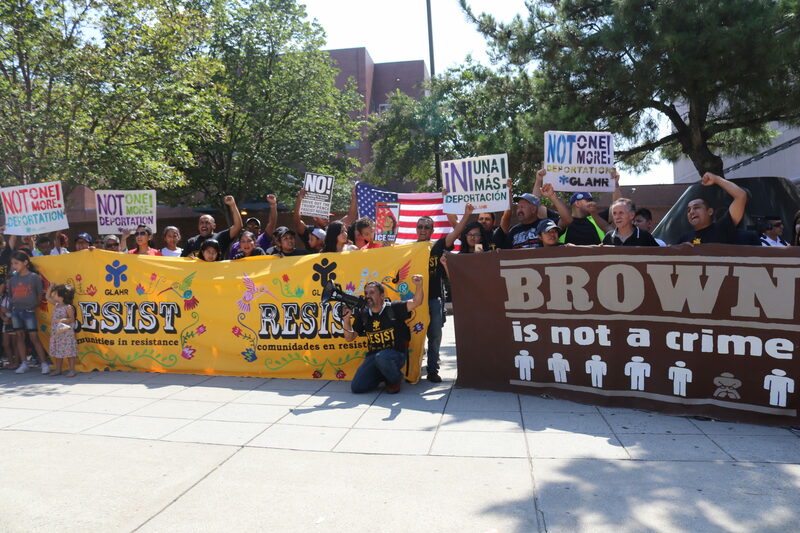 The protest was an effort to show that U.S. citizens support the DACA program and the undocumented population as a whole. “I hope to show that we stand with people of DACA and I hope to put pressure on the people in power to let them know that we all do stand with the undocumented population and we want congress to act,” said Nguyen. Naretsi Ronsas, a DACA supporter, said she understands that the children were brought here illegally, but believes that the parents were only trying to do what was best and children should not pay for the indiscretions of their parents. The Refuse Fascist organization also came to show support in an attempt to undermine the Trump administration and support the DACA recipients, according to member Charlie Abrams. “We’re out here supporting the undocumented youth, whose lives are threatened by Trump’s impending decision on DACA. We’re here with refusefacism.org and we’re building a movement to drive out the Trump-Pence regime,” Abrams said. The University System of Georgia (USG) has not taken a stance on the subject and has not made available the possible university changes that might come with this decision. The data shows that 91 percent of respondents are currently employed. Among respondents age 25 and older, employment jumps to 93 percent. 5 percent of respondents started their own business after receiving DACA. The rate of starting a business is 3.1 percent, meaning that DACA recipients are outpacing the general population in terms of business creation. 65 percent, reported purchasing their first car. The average cost paid was $16,469. 16 percent of respondents purchased their first home after receiving DACA. 72 percent of the top 25 Fortune 500 companies employ DACA recipients. These companies account for $2.8 trillion in annual revenue. 45 percent of respondents are currently in school. Among those currently in school, 72 percent are pursuing a bachelor’s degree or higher.